World War I led to the creation of a myriad of new weapon platforms, which include the Self Propelled Gun (SPG) and Assault Gun types. These vehicles had to provide direct or indirect fire support, while also having decent mobility and light armor protection. An Assault guns job was generally as a direct fire support weapon which means that a heavy gun was used to directly fire in line of sight at a target. A Self Propelled Gun was used for indirect fire support, this is where direct line of sight is not the means of aiming the weapon, and is generally a mobile artillery piece. World War II saw the implementation of the widest array of such vehicles, including the StuG III (Assault Gun), M7 Priest (SPG) and SU-76 (Both an SPG and Assault Gun). 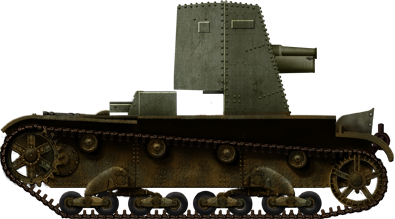 The T-26 tank was, at its core, a Soviet manufactured copy of the Vickers 6 Ton tank. As soon as it was introduced into Red Army service in 1931, methods of converting the tank into an assault gun or SPG began to be explored. 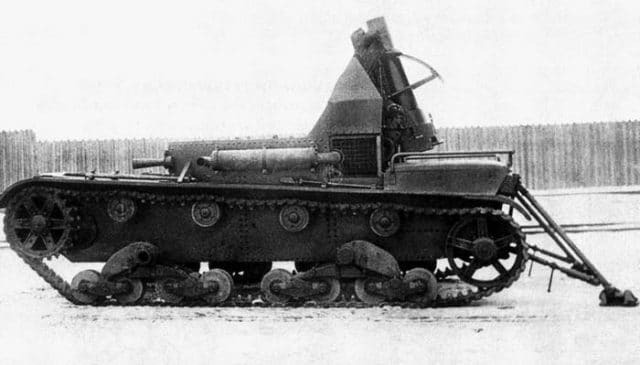 The first attempt at such a vehicle on the T-26 chassis was the SU-1. SU comes from Самоходная установка, Samokhodnaya Ustanovka, which means self-propelled gun in Russian. This was a very early attempt at an assault gun, being manufactured in 1931. It had a simple superstructure that held a KT-28 gun. The superstructure was similar to that of the production T-26, but it was taller and had a commander’s cupola. However, it did not enter production as it was deemed that the T-26-4 prototype would render the SU-1 redundant. In addition, shortly before cancellation, the interior was deemed inadequate for the crew to operate effectively, this was due to the interior being too small to effectively operate the gun and stow ammunition. The basic layout of this machine was used for the AT-1 prototype. 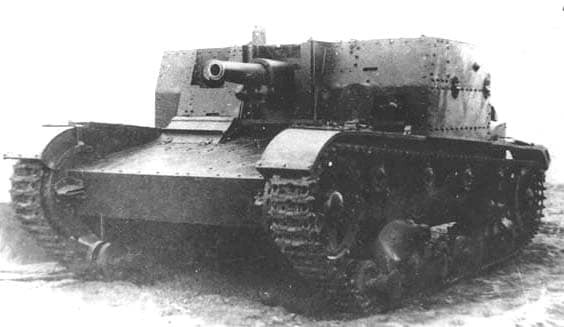 The SU-1 prototype, Notice the 76.2 mm (3 in) KT-28 gun in the hull, with the gun recuperator system exposed. The AT-1 is perhaps the best known Assault Gun of the pre-war Red Army. This was a modified SU-1, with the KT-28 gun replaced by a PS-3 76.2 mm (3 in) gun. The vehicle was tested and it was found that the interior of the tank was insufficiently large. However, before the problems could be ironed out, the designer, P.N.Syachintova, was arrested and the project subsequently shelved. The AT-1 prototype. Notice the similarities to the SU-1, with the exceptions of the gun and subtle superstructure changes. 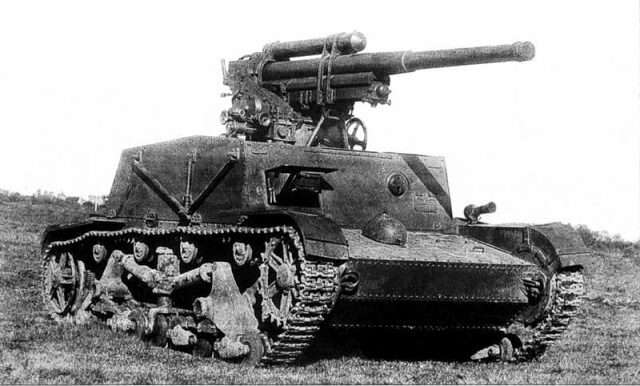 Later, in 1933, a new self-propelled gun was developed on the aforementioned T-26 chassis. This time, two guns were trialed: a 122 mm (4.8 in) howitzer and a 76.2 mm (3 in) Model 1902/1930 gun. The upper hull of the regular T-26 was relatively unchanged. However, instead of the turret ring, a hatch that allowed access to the internal ammunition stowage was installed. 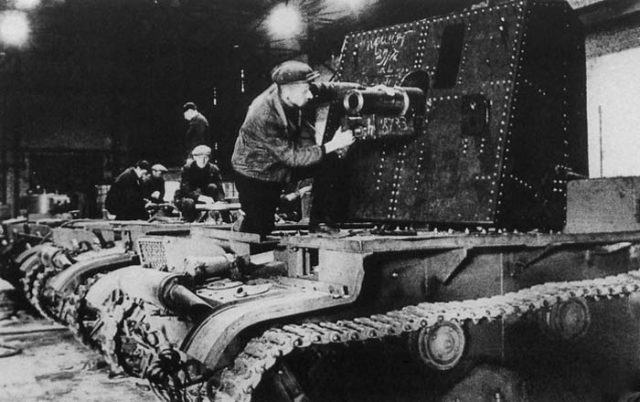 At the rear of the tank, over the engine compartment, were placed the gun mount, the crew positions, a small gun shield and two deployable legs for firing the gun. This self-propelled gun was known as the SU-5. This weapon platform would be an SPG rather than an Assault Gun due to the nature of the 122mm Howitzer and the maximum angle of the main armaments. The SU-5-1 equipped with a Model 1902/1930 76.2 mm (3 in) gun. The SU-5-1 was equipped with the 76 mm (3 in) gun or the 122 mm (4.8 in) gun, whereas the SU-5-2 was only equipped with the 122 mm (4.8 in) howitzer. The SU-5-2 differed slightly, with a strengthened hull and suspension. SU-5-1s were manufactured in 1936 in a small batch of 23 machines. Shortly thereafter, the Su-5-2 was accepted for production. However, only 20 production vehicles were manufactured. Of these machines, only 18 were still in service in June 1941. The only surviving report of the SU-5-2 is from the 67th Tank Regiment, where they were used alongside T-35 heavy tanks. These machines were lost during the opening days of the war, with one of the production tanks being reported to have been lost in the village of Gorodok (modern day Horodok) in the Lviv Oblast, where the repair center for the 67th Tank Regiment was based. A second machine was sent to Lviv for repair, however its fate is unknown. Other Su-5s were mostly deployed in the Far East and therefore survived the war to be scrapped. The SU-5-2 equipped with the 122 mm (4.8 in) howitzer. Notice that the exhaust has been moved to the left side of the vehicle, and two legs have been added. 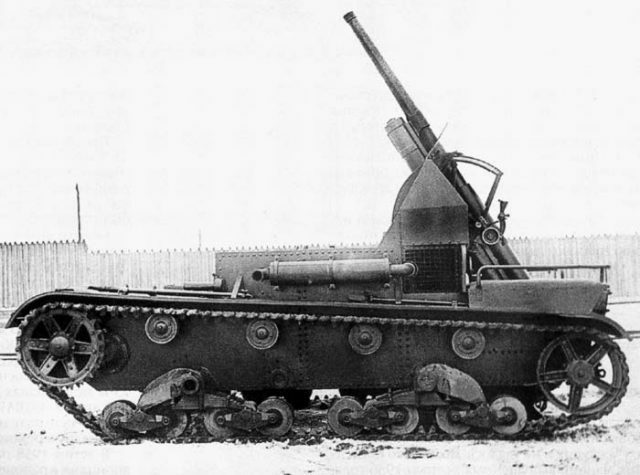 From 1928 to 1941, the Soviet Union also looked into self-propelled heavy Anti Aircraft (AA) guns. One such prototype was the SU-6. This was a heavily redesigned T-26 hull, with a collapsible superstructure and a 3K 76.2 mm (3 in) AA gun. The collapsible superstructure allowed for maximum space for the crew while operating the gun, however allowed the tank to stay the same dimensions as a regular T-26 when in travel mode. This tank was trialed in 1936, but the project was dropped. 7 hulls had been manufactured, and mass production was about to begin. However, all of the hulls were seized due to the designer’s, P.N.Syachintova’s, arrest and subsequent execution on Stalin’s orders. The SU-6 prototype. Notice the collapsible sides with supporting and levering arms under the sides. This machine could have been a potent weapon. None of the mentioned self propelled guns were successful or produced in high numbers. Therefore, there were few direct or indirect fire support vehicles ready for front line service in June 1941. 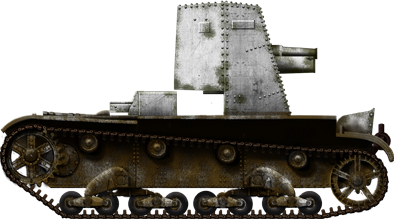 Several tank variants could provide this assistance, but their numbers were low, they were required to do other jobs such as be a main battle tank, or they were entirely obsolete. 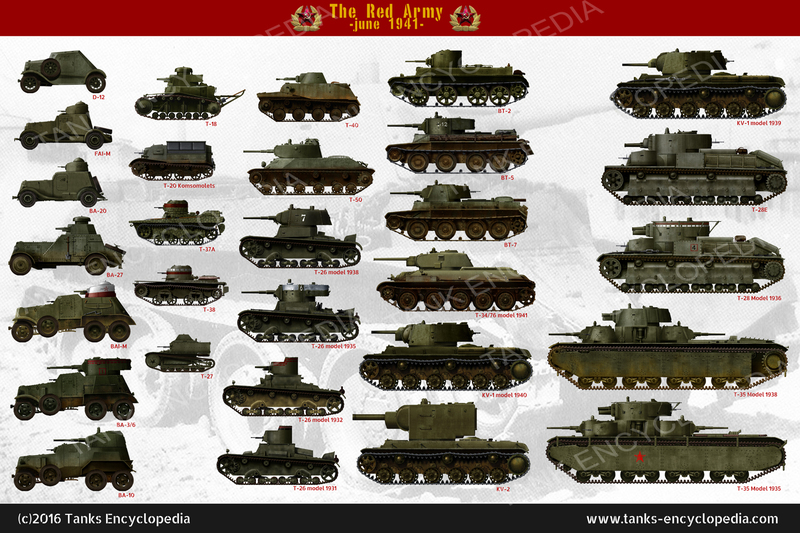 Such examples include the KV-2 with a 152 mm (6 in) howitzer, the T-28, T-35 and the BT-7 Artillery version, all having the KT-28 gun. While these tanks were not inadequate, many designs dated back to the early 1930s, or were mechanically unreliable. While not a must-have weapon, self-propelled guns could have provided a mobile mean of light direct or indirect fire to harass approaching enemy units, to set up mobile defensive points, or simply for mobile anti-tank duties. There are obvious advantages over a typical Field Gun, as the resources needed for towing and deploying it vastly outnumber the resources needed for a typical Assault Gun. The majority of Field Guns of 1941 were horse drawn, with crews numbering upwards of 8 or 9 men. In addition the ammunition for such guns had to be transported separately, these issued are solved in an Assault Gun. 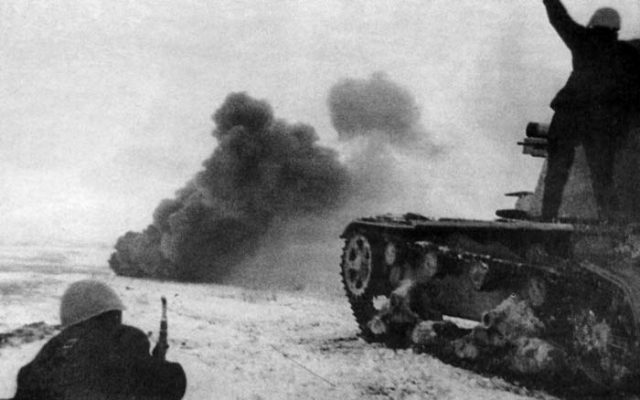 In the subsequent months after Operation Barbarossa, The German invasion of the Soviet Union, scores of T-26 tanks were lost either due to combat, breakdown, or lack of fuel or ammunition. 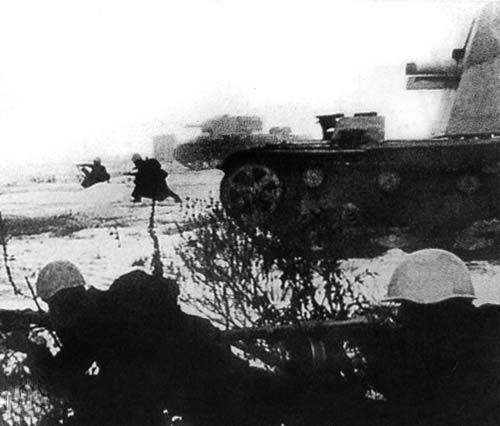 Between June and October 1941, 10,000 Soviet tanks were lost. 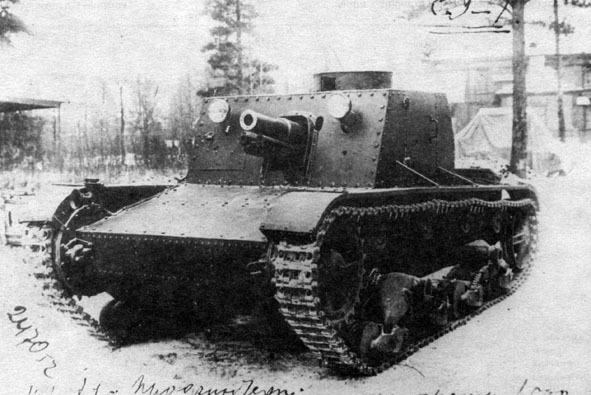 The obsolescence of the T-26 Model 1931 and 1932 in particular were clear to the red army in 1941. 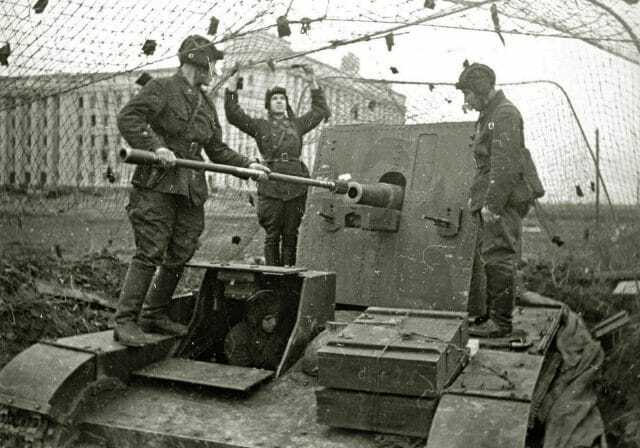 There was still 450 such machines in the Red Army in June 1941, 87 of which were in the Leningrad Military District. Even before the war, it was discussed what should be done with the machine? 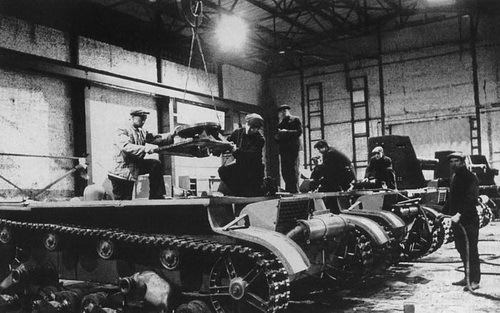 The Subsequent invasion of the Soviet Union, and impending arrival of German troops at Leningrad gave the Soviet engineers at Factory 174 within Leningrad a myriad of vehicles on which to experiment. One such experiment was a small, mobile self-propelled gun meant to assist the defenders. A propaganda photograph of Plant 174 with SU-26s being manufactured. Notice that the axis point for the gun shield is being lifted onto the hull of the foremost vehicle. A SU-26 in winter camouflage. A SU-26 in the olive 4BO green that they would have been given as a base camouflage. It is known that some tanks were painted three tone, and others were given divisional numbers on the gun shield. Once German troops approached Leningrad in Late September 1941, the question of obsolete tanks in operation was discussed once again, therefore on August the 5th 1941, Plant 174 presented a new Assault Gun to The Military Council Of The Leningrad Military District. This machine was called the T-26-6. This was done because the need for a direct fire support weapon was high, as troops needed more direct medium or heavy fire support weapons, and it was a useful way of utilizing obsolete types of T-26 tanks.On August 11th, the project was given the green light by the Leningrad Military Council, however two of the 24 hulls earmarked for converting had already been worked on. This new Assault Gun was armed with a 76.2 mm (3 in) KT-28 gun, However two 37 mm (1.46 in) guns were also mounted according to the documentation. The hull and engine deck were redesigned to create a flat platform. 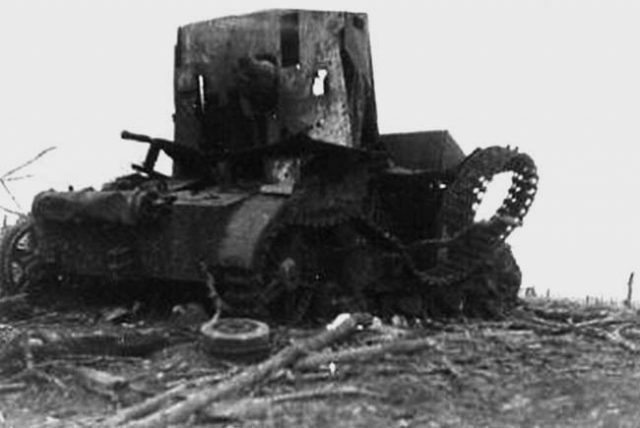 A traversable mount was added onto the tank, with a large gun shield, large enough to protect the crew crouching. The gun was mounted in the center of the shield. The original driver’s compartment was kept, but the rest of the superstructure was eliminated to make way for the gun and its mounting. Another view inside the plant, this time from the opposite end of the floor. Notice that the KT-28 gun is missing the recuperator system armor. The gun shield had a hole for the KT-28 gun in the center, with two small ports on either side of it, in which two DT-29 machine guns could be mounted. Normal operation of the mount was with the gun facing to the rear of the machine to allow for greater crew mobility. However, the vehicle could also operate with the gun firing forwards. 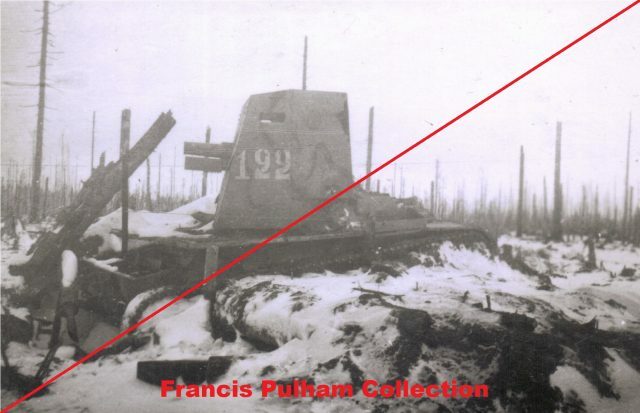 Shortly after production began however, it was decided that some of the chassis would remain as T-26 tanks as stocks of the tanks began to run short. Therefore, only 14 SU-26s were manufactured, with other chassis going towards Flame Throwing Tanks (8), and the retention of 4 twin turreted T-26s. It is likely that less twin turreted tanks were manufactured, as 24 chassis divided between the numbers provided leaves -2 tanks (it is also possible that the two 37mm equipped Su-26s are actually simply T-26s Model 1932s that were retained in the paperwork). A SU-26 in a static defense position. Notice how the crew compartment has been cut out from the original superstructure. Two DT-29s can be seen on either side of the gun. These machines were known as the SU-T-26s, T-26-SU or, more commonly, SU-26 and SU-76. SU-76 was the more common name in the records of the Red Army. However, it was changed to SU-76P (Regimental), after the introduction of the T-70 based SU-76. This was due to the KT-28 being a Regimental Gun, whereas the T-70 Su-76 was fielded with a 76.2mm Zis-3 Anti Tank Gun. A blown up SU-26. Notice that the engine deck is still accessible. It is known that the 124th Armored Brigade was issued the two 37 mm gunned versions, and three 76.2 mm (3 in) gunned tanks were reported as being lost in combat with that unit. Another unit that used these machines was the 220th Tank Brigade, which was issued four 76 mm gunned vehicles. In early 1942, an indipendant Anti Tank Battalion was created, namely the 122th Tank Brigade. This fielded Su-26s. Interestingly, these machines are supposed to have been operational up until 1944 in the Leningrad pocket. It is fair to suggest that these machines were true desperation weapons, with a poorly designed exposed gun platform. As only 14 were manufactured, too few Su-26s were manufactured to adequately analyze the effectiveness of the machine. A propaganda photograph of a SU-26 on the advance. The same propaganda film as above. Notice how the fenders have been lifted to allow for a flat platform for the crew. A Su-26 that likely served in the 122th Tank Brigade. Notice the interesting camouflage exhibited on this machine, with a base coat of white (over olive) with further olive painted on lines over the white.